With thanks to Harper Collins for the copy of this novel! As always, my reviews are non-bias and fair. Ireland, 1912; Fourteen members of a small village set sail on RMS Titanic, hoping to find a better life in America. For seventeen-year-old Maggie Murphy, the journey is bittersweet. Though her future lies in an unknown new place, her heart remains in Ireland with Séamus, the sweetheart she left behind. When disaster strikes, Maggie is one of the few passengers in steerage to survive. Waking up alone in a New York hospital, she vows never to speak of the terror and panic of that fateful night again. Chicago, 1982 . . . Adrift after the death of her father, Grace Butler struggles to decide what comes next. 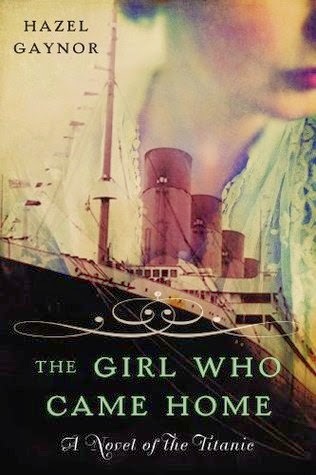 When her great-grandmother Maggie shares the painful secret about Titanic that she's harbored for almost a lifetime, the revelation gives Grace new direction—and leads both her and Maggie to unexpected reunions with those they thought lost long ago. I was instantly intrigued by the story behind The Girl Who Came Home, and I've just begun diving into the Historical Fiction side of reading in Adult and YA reads. Hazel Gaynor's novel looked just like what I was looking for. Hazel Gaynor has written an exquisite tribute to the Titanic and it shows completely through the story as the plot plays out. I could see the extent to where Hazel had researched every detail of the events that follow and seep out into the storyline. Maggie and Grace were both very different characters in personality stances, and to see the development of each character built throughout the novel was really refreshing to read about, also knowing of the true events that had weaved into the book, too. We all know something about the Titanic, whether it's the little things or some of us may know more being History fans. Anyway I look at it, Hazel Gaynor has done a beyond amazing job of the extensive description, emotion and gripping events. I was mesmerized by every detail that just seemed to echo originality and charm. The Girl Who Came Home is a heartbreaking emotional read, keeping readers on their toes. It was ultimately about finding tranquility in the past, overcoming events and of course; love. It was different to most other Historical Fiction I've read, but I still managed to connect with the characters and care about them, which says a lot about how powerful the story has managed to pull me into it's grip. There are just parts that left me speechless and other times where the descriptive narrative painted an image into my mind beautifully of those times, even as tragic as they were. Without giving too much away, finding the symbolism or peace within the story was my favourite part of The Girl Who Came Home or definitely the Maggie parts. I liked Grace's parts, too, but Maggie's were just incredible. Historical love-story fans, Historical Fiction fans or people who are fascinated with the Titanic or want to know more about it's events. I would say just take a chance on it, because even the books we don't think we'll click with, just might surprise you. Have you read The Girl Who Came Home?